Sean Caspian and I locked ourselves into the newly-built eciov studio last weekend and produced this quick parody for all the Elder Scrolls Online fans in the crowd. We called it “ESO, ESO, ESO” because it’s a parody of the classic song “Let it Snow.” He came up with the idea, and we brought it to life together. 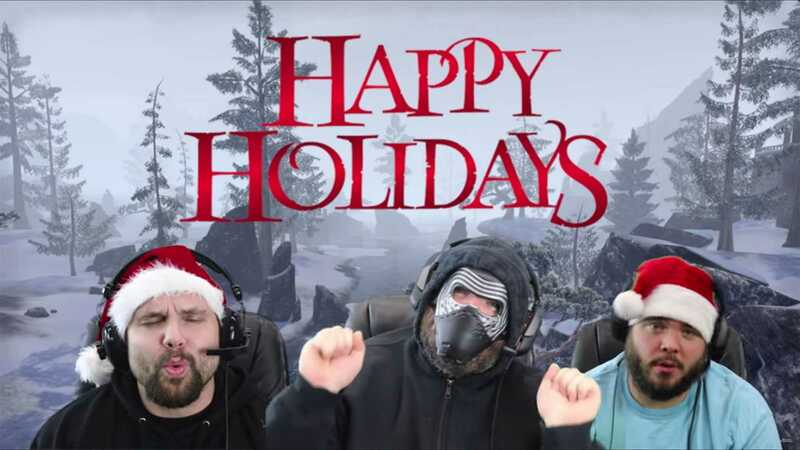 Take a two-minute break from your day and watch the festive gaming video now. I wrote the musical arrangement and lyrics then recorded the instruments and vocals here in the studio. Once I was done, Sean Caspian came over and tossed his vocals onto the track. After finishing the audio portion, we spent some time figuring out what we were doing with the video. Since this was for his YouTube channel, we needed it to be fun and high quality. We decided to take shots of high-resolution, in-game footage that matched the lyrics I wrote for the parody. In between shots, we would cut to us singing the lyrics of “ESO, ESO, ESO.” We booted up my epic gaming rig that I use for our streaming videos and used XSplit to capture the in-game footage. We recorded a few festive shots like snowfall in Windhelm, a fireplace at the inn, and bedrooms for our green screen backgrounds. We think they turned out pretty sweet. After capturing all that footage, we sat in front of the green screen and sang the lyrics to “ESO, ESO, ESO.” We asked a third person to show up, but they couldn’t make it to the studio session. So, I ended up playing our third person while wearing a time-appropriate mask. You’ll have to watch the video to see it. After that, I gave all the footage and audio to Sean Caspian to have him work his editing magic. You’re a wizard, Sean. That, ladies and gents, is how we ended up with the “ESO, ESO, ESO” parody of “Let it Snow.” It was a fun project that we’d love to see turn into future work. If you live in Denver and have use for the eciov studio for your project, please head over to the Drift Management website. We’ll set you up with a date and time from there. We can help with the video production, the creative, or just let you use your own equipment in our soundproof, acoustically-treated studio space.